The second important ingredient is carrot oil which is rich in beta carotene -a potent antioxidant that fights against free radicals- and also rich in vitamins A & E. Carrot oil is a carrot roots' infusion in a vegetable oil and has a healing, moisturizing action to dry skin. Another precious ingredient is shea butter (Butyrospermum parkii) that promotes skin elasticity and contributes to cells' renewal. Jojoba oil (Simmondsia chinensis) will be also added as it penetrates the skin easily and it's highly anti-oxidant. In the water phase, aloe gel will be used for its moisturizing and softening properties and also chamomile hydrosol or herbal tea for its anti-inflammatory action. * for this recipe measuring teaspoons were used: 1 tsp=5ml. 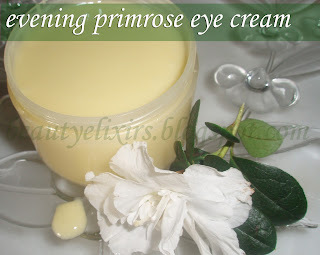 To make the Evening Primrose Eye cream follow the step by step tutorial in this link: how to make an all natural cream. 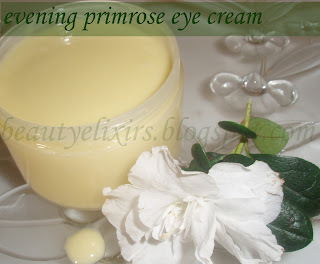 Vitamin Ε is oil-soluble and will be added to the cream mixture when the temperature is under 35 C (95F). The sensitive evening primrose oil will be added to cream mixture once the temperature is under 35 C (95F). I don't think I have to explain why you should try this cream. The selection, the combination and the synergy of oils and active ingredients result to a nourishing all-natural cream ideal for the soft and sensitive eye skin. Use a small quantity each time.